Reggie Jackson, or "Mr. October" for his outstanding performances in the postseason, is baseball's most memorable clutch player. In 27 Fall Classics, the 1973 AL Most Valuable Player hit 10 homers and had a .357 batting average. With 563 career home runs Jackson became the first player to hit 100 or more homers with three different teams, the Oakland A's, the New York Yankees and the California Angels. In 1993 Mr. October became an official member of the Baseball Hall of Fame. 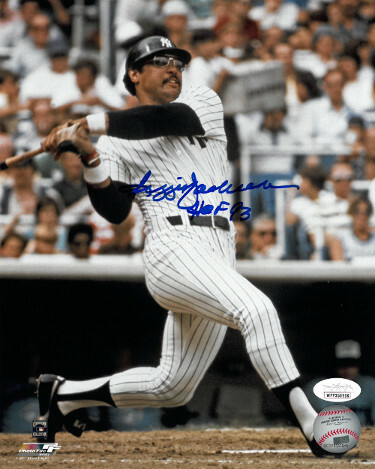 Reggie Jackson has hand signed this New York Yankees 8x10 Photo with HOF 93 inscription. JSA Witnessed Hologram and Certificate of Authenticity.